Groundwater Resources & Wastewater Disposal Projects | Geo-Technology Associates, Inc.
Below are some examples of our Groundwater Resources and Wastewater Disposal projects. GTA evaluated existing groundwater supply well field drawdown, pumpage and test data, and prepared a work plan for well field testing. Performed operational 90-day well field testing to evaluate system performance and as a basis for providing recommendations on optimization of groundwater withdraws. 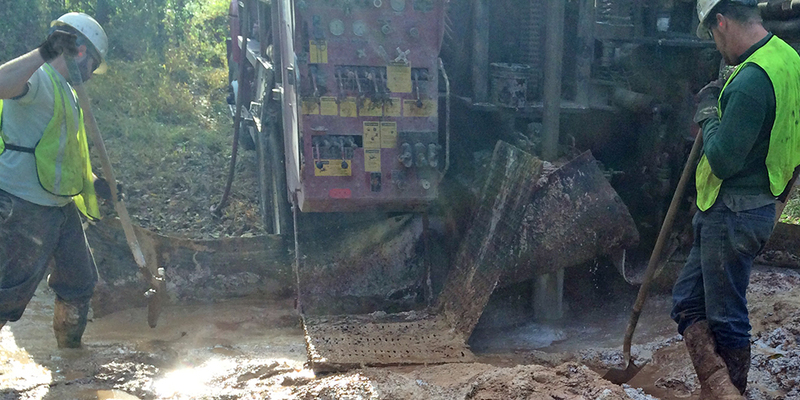 The test consisted of simultaneously pumping eight wells during a 90-day test period, observing groundwater level responses and logging flow rates. GTA analyzed well performance, potential well interference and pumping/drawdown data in the context of system constraints. GTA provided an estimate of sustainable well field yield, and provided recommendations on optimization of well performance. 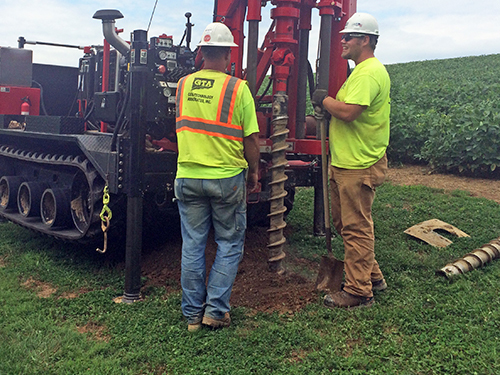 GTA performed groundwater resource evaluations in Gap, Pennsylvania for the purpose of developing potable and fire-suppression groundwater supplies. GTA performed fracture trace analysis, test well siting, water supply well drilling management, aquifer testing and yield analysis for two sites: the Urban Outfitters fulfilment center; and, a proposed Comfort Inn and Suites hotel site. For potable supplies, GTA performed groundwater sampling with samples analyzed by a certified laboratory for New Public Supply Well parameters. 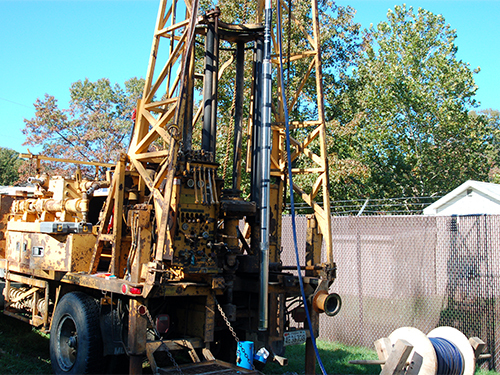 GTA coordinated drilling, testing and analysis with Pennsylvania Department of Environmental Protection personnel. GTA obtained groundwater supplies that exceeded site water demand. GTA coordinated with the Civil Engineers for the project with respect to water delivery and treatment system design. 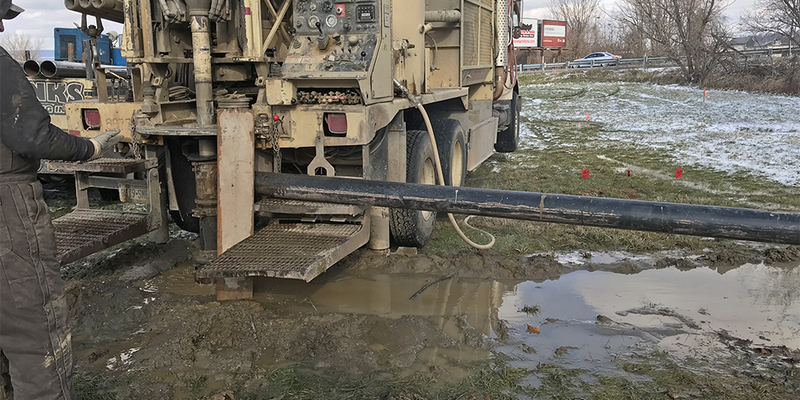 GTA performed a multi-phase soils and hydrogeologic characterization program to evaluate site suitability for the spray irrigation of up to 1 MGD of treated wastewater. 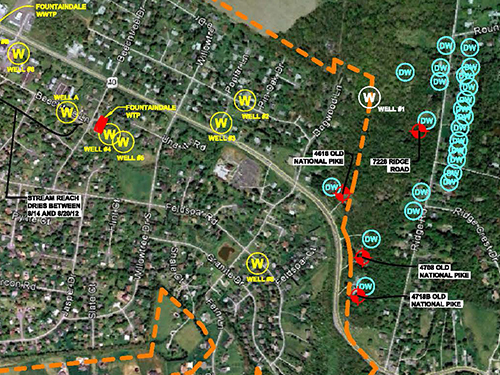 The evaluated site consisted of an approximately 200 +/- acre tract. GTA coordinated operations with the Town, the design engineer and the Maryland Department of the Environment (MDE) reviewing agency. GTA performed soil mapping, detailed soil profiles and double ring infiltrometer testing for the initial soil suitability evaluation phase. Ten monitoring wells were installed along with pumping and observation wells for use in aquifer testing and aquifer parameter estimation. GTA performed soil chemistry analyses and hydraulic loading/cover crop nitrogen uptake calculations for evaluation of potential wastewater application rates. Groundwater quality analyses were performed to establish background water quality, and numerical groundwater flow modeling was performed to evaluate groundwater mounding potential. GTA facilitated issuance of a groundwater discharge permit from the MDE for the Town; the system is in operation. 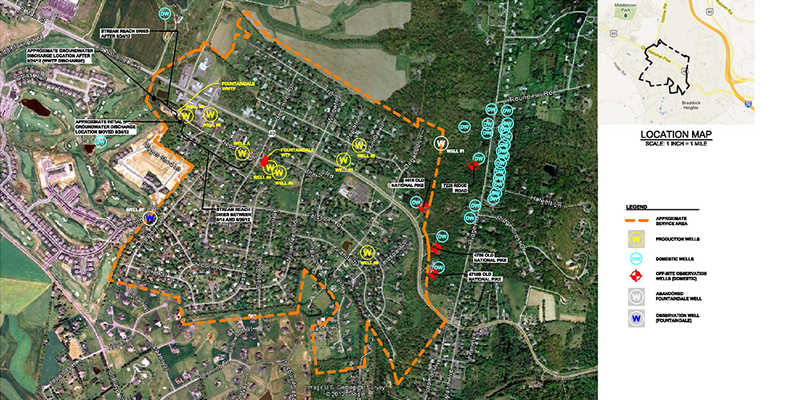 GTA performed a preliminary feasibility evaluation for on-site wastewater disposal via spray or drip irrigation systems for the proposed residential development property in Westtown Township, Pennsylvania. The site was proposed for up to 397 residential units, and was estimated to have waste water flows ranging from approximately 80,000 to 100,000 gallons per day (GPD). 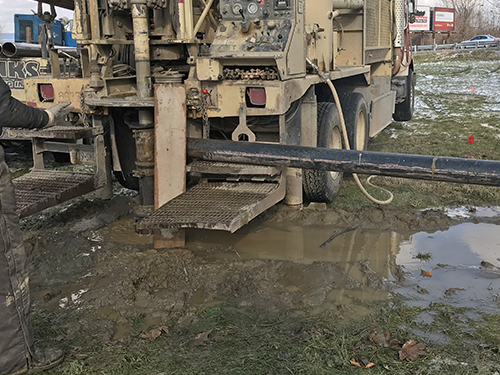 The evaluation consisted of test pit exploration, soil profile evaluation, infiltrometer testing, soil borings, hydraulic testing, water quality evaluation, and groundwater mounding analysis. 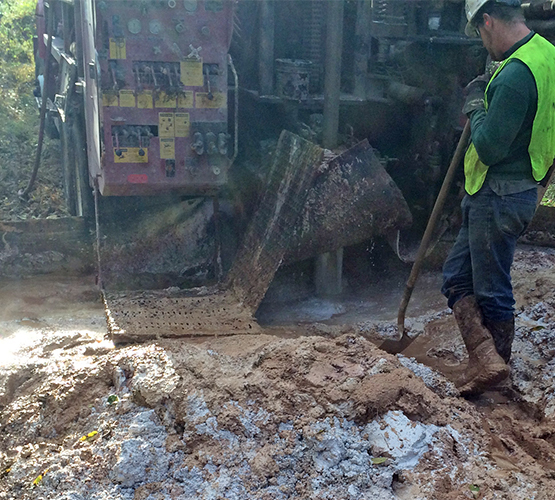 The results of our evaluation indicated that onsite wastewater disposal at the site was feasible. 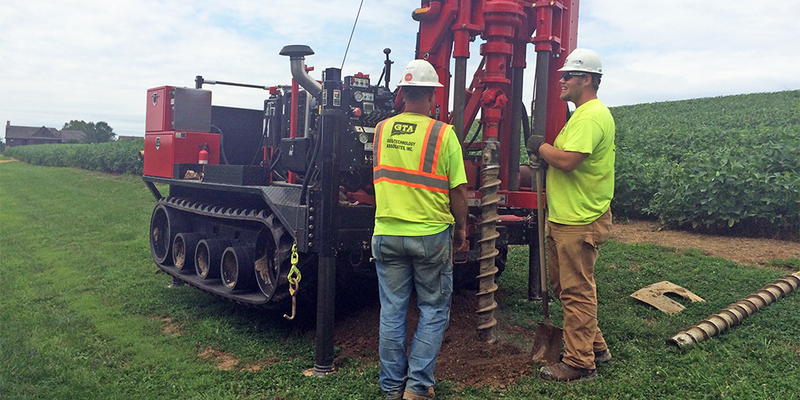 GTA performed a groundwater resource evaluation for the drilling and installation of a public supply well for a new office facility at the New Windsor Quarry site located in Carroll County, Maryland. The water supply system was intended to serve at least 25 people on a regular basis, and as such was regulated as a non-transient non-community water system by the Maryland Department of the Environment (MDE). 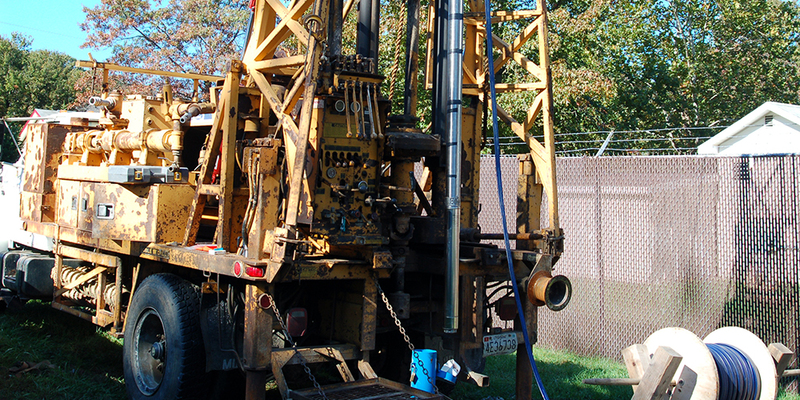 GTA sited and observed the drilling and installation of the supply well, and performed the hydraulic testing and groundwater quality sampling required to obtain MDE approval. GTA also coordinated closely with the Civil Engineer for their water system design and MDE-required Capacity Development Plan preparation. Please see our Careers section or click on the office location to view our current openings. © 2019 Geo-Technology Associates, Inc.